I contacted the support team to assist me to configure and test Fastcall, I can say that they were very reactive and they give me great assistance. Thanks guys. I find Fastcall very interesting. Salesforce native Open CTI Softphone. Click-to-Call with your existing hard phone. Be super efficient dialing outbound with our voicemail drop, local caller IDs, and list dialing. Control missed inbound calls with record pop in Salesforce, IVR, ACD, voicemail transcription. SMS one contact or a list; templates added just like email. Native app instantly logs phone and SMS activities without the Salesforce API. Managers like our app because they can find sales performance data at their fingertips. Administrators love the simplicity, while phone sales teams enjoy ease-of-use. Executive leadership trusts Fastcall as a native Salesforce app. Like sales performance data and call recording at their fingertips. Love the simplicity of implementing and managing Fastcall. 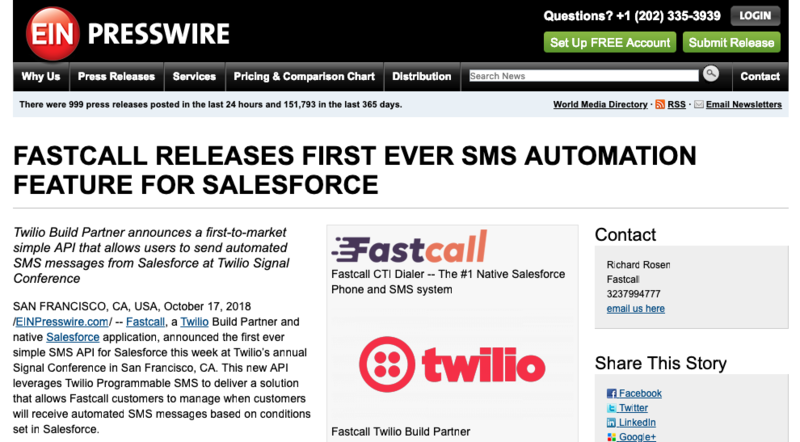 Appreciate that Fastcall is built on the Salesforce platform.